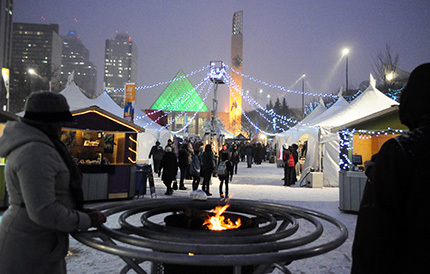 Winter is a core part of Edmonton’s identity and needs to be fully considered as our city grows and matures. In order to realize the full return on our investments, development and public infrastructure projects should work year-round, not just for our summer conditions. 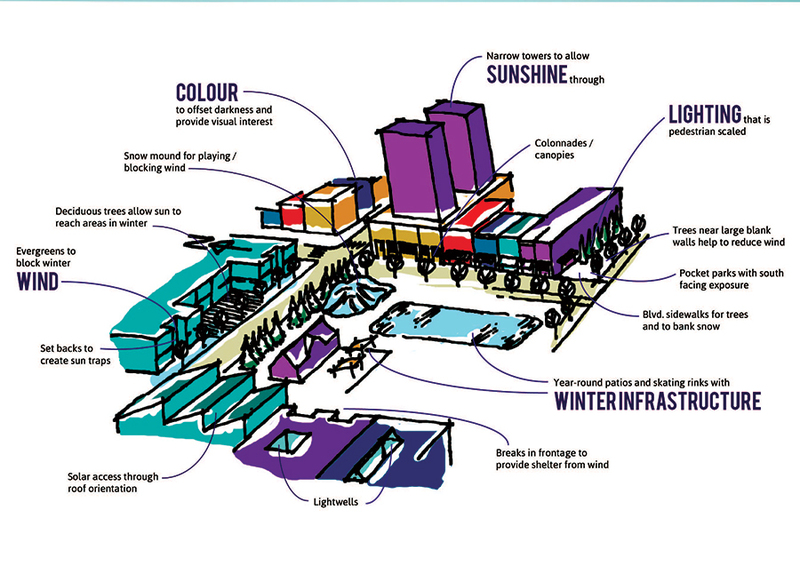 The Winter Design Guidelines (9.1 MB) will provide a robust winter lens that can be applied to future development decisions throughout Edmonton. These 5 principles can be applied to all contexts (neighbourhoods, streets, sites and open spaces) in a myriad of different ways. The Winter Design Guidelines provide flexible guidance and inspiration. The Winter Design Working Group has been leading the development of these guidelines and includes key stakeholders from the areas of local government, urban planning and design, landscape architecture, architecture, engineering, transportation, parks planning, EFCL, and land development. In addition, 3 collaborative sessions called Design Dens were held to provide an opportunity to reach a broader group of stakeholders and to workshop the draft guidelines. A Core Project Team with staff from Sustainable Development and the WinterCity Office within Citizen Services is responsible for coordinating and supporting the Working Group, as well as developing and finalizing the Winter Design Guidelines. The guidelines are intended for the use of city builders such as landowners, developers, planners, designers, engineers and their consultants, as well as City staff reviewing development applications. They will also be used by the City when designing civic and public realm improvements. These guidelines are expected to be a useful resource for community groups and the general public as well. City Council approved a Winter Design Policy in December 2016 that references the guidelines. The policy calls for all bylaws, plans, procedures, policies, directives, standards to be updated to include a robust winter lens to all City projects and developments. It also calls for the City to promote, collaborate, cooperate and partner with city builders in both the public and private sectors to realize the vision of Edmonton as a global model for winter city living. The implementation plan for the guidelines explains that the City’s regulations, policies, guidelines and standards will be updated to include a robust winter lens as opportunities arise. It is an incremental, continuous improvement approach. The implementation plan also recommends producing information resources to share leading practices with local communities. We are now working on winter design brochures that will be widely distributed to community leagues, business owners and residents, to ensure all our citizens understand the benefits of designing for winter.